Lionfish or volitans are venomous fish belonging to the family Scorpaenidae whose literal translation means scorpion fish. There are five genera and 16 individual species commonly referred to as lionfish. Their natural habitant is among the reefs and rocky crevices of the Indo-Pacific and the Red Sea. This species is not native to warmer tropical regions of the world. Recently established populations are present in the Eastern Atlantic, the Caribbean and the Mediterranean Seas. They are becoming more and more common place off the Florida coastline. Scientists speculate that these species were first introduced when a public aquarium was destroyed in southern Florida by Hurricane Andrew, a Category 5 hurricane in 1992. DNA analysis from captured fish supports this theory. All newly established populations originated from the same seven fish. The continued non-indigenous prorogation of this species has created concern among ecologists. It is yet to be determined what kind of human and environmental dangers these creatures will pose in their new breeding grounds. The lionfish is inarguably one of the more exotic creatures you will ever see in a home aquarium. They are one of the most prized fish in the aquarium trade. There are 11 species from two distinct genera (Pterois and Dendrochris) readily available to home aquarists. The Dendriochirus lionfish's fins form a solid fan with individual fin rays held together by a connective membrane. Pterois lionfish have long flowing fin rays that are individually sheathed by the membrane. The fins on a Pterois extend well past their tail. There is one species of lionfish, the Pterois sphex, which resides only in the waters off the shorelines of the Hawaiian Islands. Regardless of the species everything about these fish, from its regal fanned main to its cantankerous demeanor, says, "You don't want to mess with me." This fish is also marketed under the aquarium trade names turkey fish, dragon fish, scorpion and fire fish. All lionfish have distinctive fins as well as fin and body striping. Color palettes and size are particular to species. Dwarf lion fish only reach an adult length of 5-6 inches and can be kept in an aquarium as small as 30 gallons. Other species can grow to in excess of 15 inches and will require a 75-100 gallon tank. These are among the most poisonous creatures found in the ocean and should only be kept by expert aquarists. Lionfish are voracious predators. There are very few species in the wild that would even consider harassing one more or less attempting to eat it. Strangely enough, their venomous fins are not used for the purpose of predation. They rely on their natural camouflaging and split-second reflexes for hunting. Lionfish capture their prey by boxing it in with their large fins and then swallowing it whole. Their venom is used strictly as a means of defense. When threatened the lionfish will lunge at its opponent with its up to 18 needle-like dorsal spines erect and ready to neutralize the aggressor. 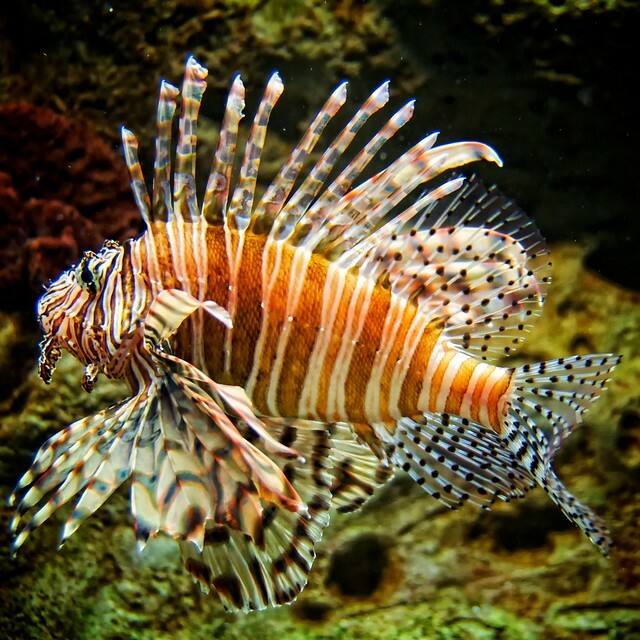 Due to its predatory and venomous nature lionfish are best suited for a mono-species or multiple lionfish species tank. You can keep more than one in an aquarium. You will want to take the fish's current and potential adult size into consideration. Lionfish have been known to prey on one another. Lion fish are carnivorous. Smaller fish can be fed frozen carnivorous marine food products. They will also readily eat brine shrimp. Larger fish should be fed feeder shrimp or small fish. Although not generally marketed for consumption, lionfish are considered a culinary delicacy in some regions of the world.